Kiwis love movies and TV shows as much as anyone, but we’ve always lagged behind other countries in terms of content available. 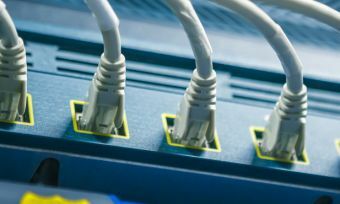 According to Stuff.co.nz, an estimated 30,000 Kiwis had used a virtual private network (VPN) to gain access to the US version of Netflix, in order to view the wealth of content they had available. Fortunately, Netflix was officially made available in New Zealand in March 2015. The much-anticipated arrival of Netflix on the shores of New Zealand was a game-changer in more ways than one, bringing online streaming even more to the mainstream that it is already. However, Netflix NZ is not perfect, and there are plenty of other options available to suit your streaming needs. Canstar Blue has put together a review of the major streaming services available in New Zealand, to help you decide which is best for you. Since the U.S streaming giant launched in NZ back in March 2015, it has dominated the streaming market. While the official number of subscribers for Netflix NZ are not made available, the latest figures released back in December 2015 showed that approximately 400,000 Kiwis had adopted Netflix – almost 10% of the population! It has proven to be the most popular among younger generations, such as young singles and young couples. While this is likely due to the fact that younger people are more likely to adopt more modern technology such as streaming services, it is also indicative of the type of premium content Netflix offers. Netflix NZ features roughly 1500 TV shows and movies in their catalogue, yet staggeringly, this is only about 1/6th of the amount available in the US version, which is why a lot of people are still flocking to it using a VPN. However, there is still a lot of high-quality and popular content available among these 1500. There are now some brilliant TV shows available on Netflix, such as House of Cards, Orange is the New Black, Unbreakable Kimmy Schmidt and many more. While Netflix does tend to focus on TV shows, that isn’t to say they don’t also have some excellent movies to choose from. Some of the classics they have on offer include The Matrix trilogy, Saving Private Ryan, Fight Club, Forrest Gump, and many, many more. In addition to the 3 different pricing plans, you can also watch Netflix on your computer, gaming console, mobile, tablet or a Smart TV. So there are plenty of options if you decide that Netflix is for you, and if you want to watch the latest hit shows from the U.S as soon as they are available, then this might be the case. Launched in late 2014, Lightbox is an online TV service accessible on computers, tablets, Smart TVs and PlayStations. Lightbox is owned by Spark, and is one of New Zealand’s biggest competitors to the juggernaut that is Netflix. Lightbox has approximately half of Netflix’s subscriber count, with approximately 128,000 people paying for their services – NZ Herald. It’s possible that this number is higher, but none of the streaming services in New Zealand release their subscriber numbers due to ‘commercial sensitivity’. One major disadvantage Lightbox has compared to its competitors is that it doesn’t offer movies. All of the other entries in this article offer movies, but for the foreseeable future, it looks like Lightbox will continue to only offer TV shows. However, if this isn’t a problem for you, then there is definite value for money to be found in Lightbox’s $12.99 fee per month, which includes high-definition on multiple devices. This is the same price as Netflix’s standard package deal as well as Quickflix, but is cheaper than Neon. It is also worth mentioning that you get free access to Lightbox if you have a Spark residential broadband plan. Neon is an entertainment service owned by Sky Television, and was first launched in December 2014, and can be viewed on up to 5 different devices at once. These devices include your smartphone, tablet or computer. Neon has the lowest subscriber count among the on-demand providers in this article, registering an estimate of just 22,000, which is will behind its competitors. There are a number of possible reasons for this. First of all, Neon’s monthly price is by far the highest of any of the entries on this list, setting you back $20 a month for HD streaming. This is the only pricing option available, and is much higher than the $12.99 per month offered by Netflix and Quickflix, as well as the $15 a month for Lightbox. Another setback for Neon is that while they do offer some of the world’s most in-demand content such as Game of Thrones and The Walking Dead, you have to wait a while to be able to watch the newest episodes. For example, Game of Thrones isn’t released until months after it airs on Sky’s Soho Channel. Neon does offer some quality movies however, such as The Dark Knight Rises. Plus, it is well-known for its selection of RomComs and Chick Flicks like The Notebook, P.S I love you and The Sisterhood of the Travelling Pants 1 & 2. If these are your kind of movies, then definitely consider Neon. Quickflix is an Australian and New Zealand streaming company that was around well before the other streaming services entered the market. It first started offering an online subscription service in 2011, and now has approximately 130,000 subscribers across Australia and New Zealand. Quickflix seems to offer a slightly more popular catalogue than its immediate competitors, and has a total of over 2,000 entries to choose from. Quickflix’s most popular shows include the in-demand House of Cards (Premium only), Orphan Black, The Office, The West Wing and Doctor Who, just to name a few. Also on offer are critically acclaimed movies such as Batman Begins, Zero Dark Thirty, and the wildly successful Disney movie Zootopia, just to name a few. So it doesn’t have the same depth that Netflix does, but Quickflix still offers an excellent range of content that justifies its price tag. Once the dominant force of the video rental industry, VideoEzy has fallen on hard times in recent years, as a combination of online streaming as well as illegal downloading has seen the demand for physical DVD copies fall into niche territory. In 2014, VideoEzy opened an online platform to combat this rapid decline. Rather than paying a monthly fee, you pay as you go in terms of renting or buying TV shows and movies. It costs approximately $2.99 to rent a movie in standard definition, or $3.99 for high-definition. Access to VideoEzy on demand in available exclusively through Samsung Smart TVs. The last entries on this list are two smart media players: Apple TV and Google Play. Both are plugged into your TV with a HDMI cable, and they take content from the internet and display it on your television set. While they can perform a host of functions such as viewing YouTube videos, their main purpose in the context of this article is to download TV shows and movies. 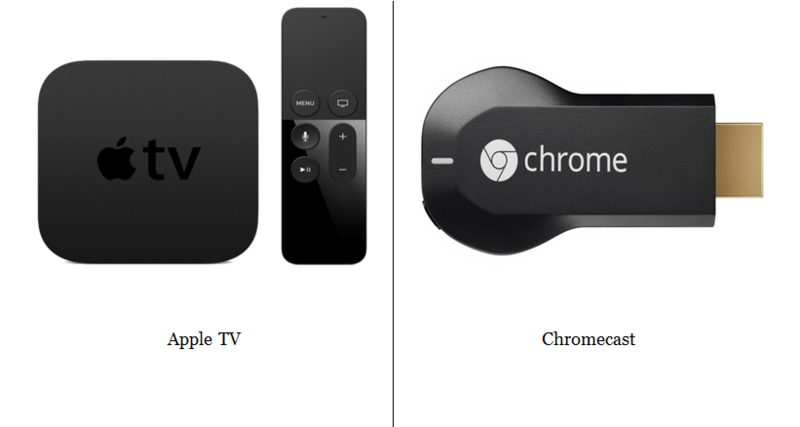 You can see below what Apple TV and Google Chromecast (what you plug in to access Google Play) look like respectively. They are different from the other entries here in that you have to pay for each individual movie or show, rather than pay for a package deal. Since they get their content from the android and iTunes store respectively, they have pretty much everything you could ever want to watch – the only difference being that you have to pay for them individually. For example, they both have every episode of Game of Thrones available almost as soon as they air, but you have to pay $2.99 for each on Google Play or $3.49 on Apple TV. The prices for each TV show and movie can vary, so you’ll need to look these up before purchasing. So if you want the latest hit TV shows and Blockbuster movies as soon as they are available to the public, and don’t mind paying a little extra to do so, then definitely consider Apple TV and Google Play. The only real downside to these two services is that they are quite expensive to set up. Depending on the storage size you’re after, Apple TV can cost anywhere between a whopping $299 to $399 dollars, whereas Google Chromecast costs a mild $50-$70. But it is important to remember that this is a one-time fee – there are no monthly fees once you’ve bought it. With such a well of entertainment-enabling streaming systems at our fingertips, it’s no wonder that Kiwis are glued to their screens – big and small. With so many choices available to you, it can be hard to pick the right one, especially if you don’t know exactly what you’re after. Fortunately, all of these providers – with the exception of Apple TV and Google Chromecast – offer month long free trials. Make sure you use these to gauge how you feel about each provider, to ensure that you’re picking the right one for you.